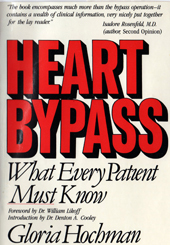 Heart Bypass: What Every Patient Must Know with an Introduction by Dr. Denton Cooley, then surgeon-in-chief of the Texas Heart Institute, and Foreword by the late Dr. William Likoff, president and chief executive officer of Hahnemann Medical College in Philadelphia . . .